A couple years ago, Liliana and her 2 cousins (that were all born within a couple months of each other) decided they wanted to be baptized together in what they titled, "A triple baptism." We all liked the idea and even though one of the cousins lives in Utah and the other lives in Connecticut, we decided we wanted to make it happen. Last weekend was the big event. 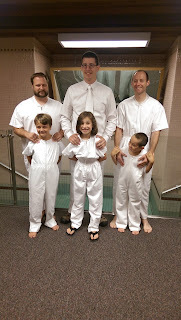 Liliana, Mason, and Daxton all got baptized by their fathers back-to-back in a wonderful "triple baptism." We were blessed to have many wonderful friends (both old and new) and family members come from near and far to show their support for these young folks and their decision to follow the Savior and live Christ-centered lives. It was a spectacular day.